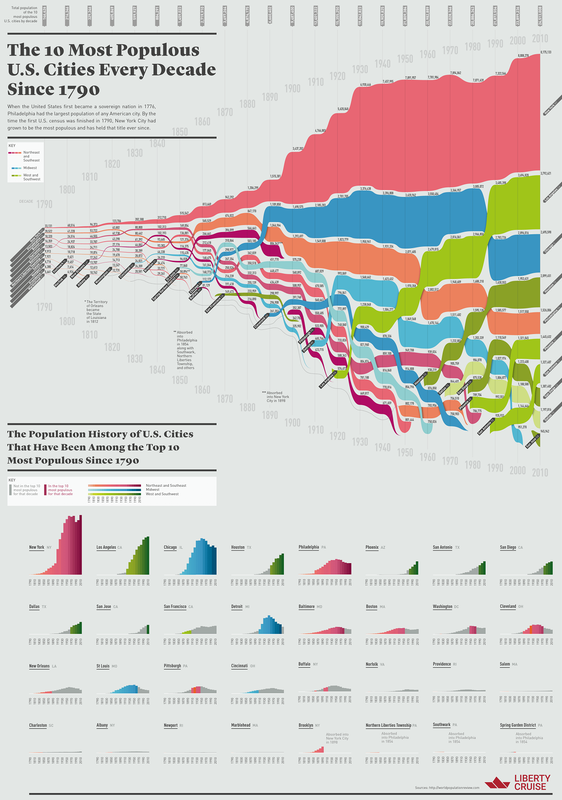 The 10 Most Populous U.S. Cities Every Decade Since 1790 #infographic ~ Visualistan '+g+"
The United States Census began in 1790 during a time of major growth across America. As the country developed and people began to spread out, the government used it to better understand the needs of our nation. The census has been continually changing over the past 220 years, with new questions being added as time goes on. Over time the census began collecting data on social statistics, taxation, religion, crime the census began it asked questions regarding social issues, taxes, religion, crime, health, housing, and more . The U.S. Government is even currently in debate about whether or not the 2020 census should include a citizenship question. When the census first began the United States had a population of just under four million people. Today the most populous city in the country, New York City, has a population more than double that of over 8.1 million people. Has your city ever landed in the top ten most populous cities in the nation during a census? Find out now on this data visualization from LibertyCruise.nyc.